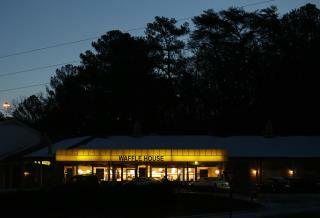 (Newser) – A Waffle House customer in South Carolina decided to get behind the counter and cook his own meal after he couldn't find any employees who were awake. Alex Bowen says he was "pretty inebriated" when he stopped by the West Columbia restaurant at around 3am Thursday, WIS-TV reports. He says after waiting for around 10 minutes for somebody to take his order, he got behind the counter and took care of it himself. "Got hot on the grill with a double Texas bacon cheesesteak melt with extra pickles," says Bowen, who shared selfies taken in the kitchen on Facebook. "When I was done I cleaned the grill, collected my ill-gotten sandwich, and rolled on out." "pretty inebriated" Sums up every meal I've ever had at the WH. The guy was nice though, let the cook sleep and whiped up some eggs. If Waffle house doesn't want customers behind the counter, maybe they should get more than one employee at each location on the night shift so they can keep each other from falling asleep on the job! That's adorable. :D I like that he didn't want to wake the employee.